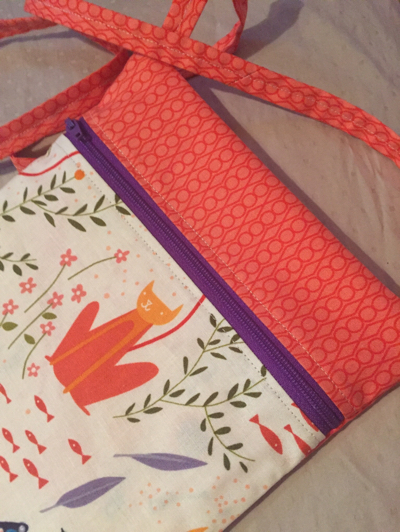 A few weeks ago, I signed up for a new Craftsy Class on zippered bags: Zip It Up - Easy Techniques for Zippered Bags with Joan Hawley as the instructor. I had done a couple of zipper pouches before but I was never really happy with my zippers and never got really consistent results. The class is really, really good. Joan Hawley is a good instructor and she demonstrates a bunch of really neat tricks for installing the zippers, finishing seams and pressing your project so it looks professional. I found that although the patterns are clearly written, you really benefit from watching the class as you work on the bags. She provides a lot of information in the videos that aren't necessarily covered in the written patterns. 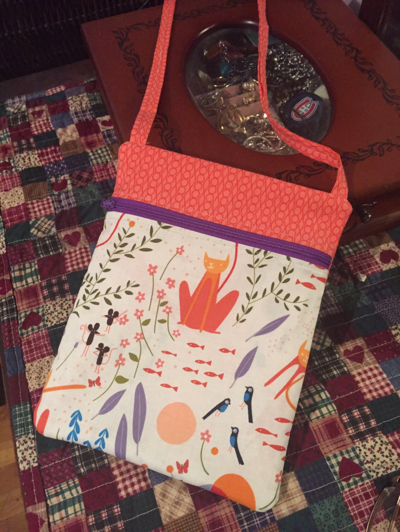 Anyhow, I was itching to make one of the bags, but didn't have any fusible fleece until last weekend. So this week, I made my very first Runaround Bag. I used 2 fat quarters from Lizzie House for this bag. I just love the cats on this Cat Dream fabric and this was perfect for my daughter Marianne who just loves kitties. The zipper isn't perfect, but it looks pretty good I think! Making this bag really wasn't difficult at all - I cut all the fabrics one evening before going to bed and I put the bag together in about one hour the following evening. 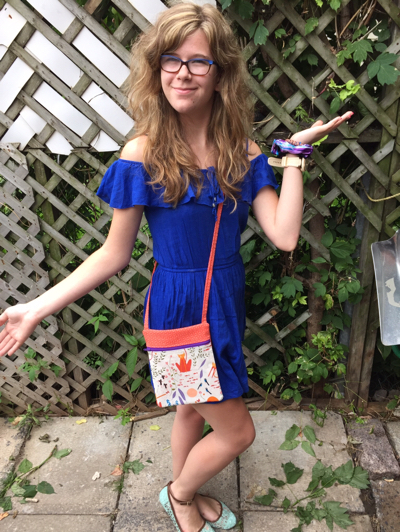 And here is Marianne modeling the bag for me. 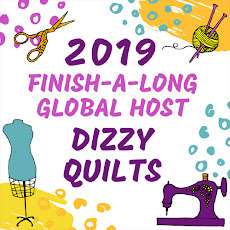 I will be linking up this small finish over at Crazy Mom Quilts and at Quilt Matters for TGIFF. My son Max has finally received a bed quilt from me. He requested something simple, with dark colours and not too heavily quilted. 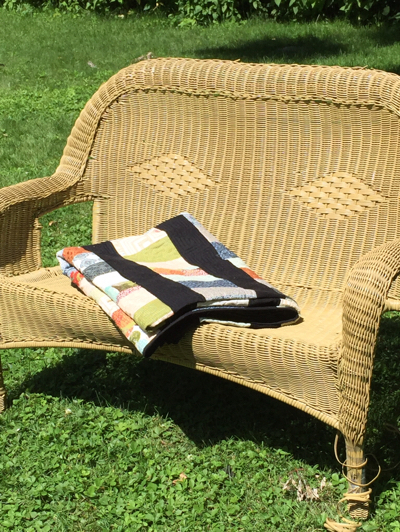 For the main fabric pieces, I used a bundle of World Tour by Parson Gray and a bundle of Juggling Summer by Zen Chic. The black is Kona and I used the same black for the binding. 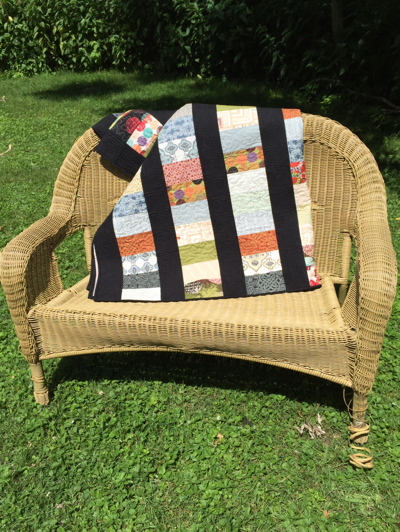 The pattern is from the April 2011 edition of Quilter's World called "Greydations". The quilt finishes at about 66" x 88". 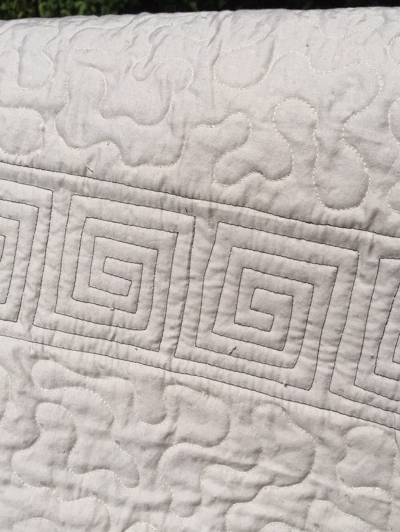 For the quilting, I quilted the prints with a soft meander in light grey Aurifil 50 wt thread and in the black rows, I quilted square spirals with black Aurifil. 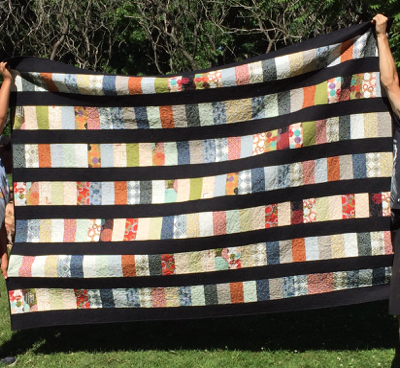 You can see the quilting on the back on the quilt which is a soft cotton sheet. This is my last finish for this quarter and was on my Q2 FAL List. 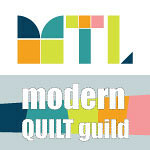 I will be linking up at Crazy Mom Quilts and at Quokka Quilts for TGIFF.